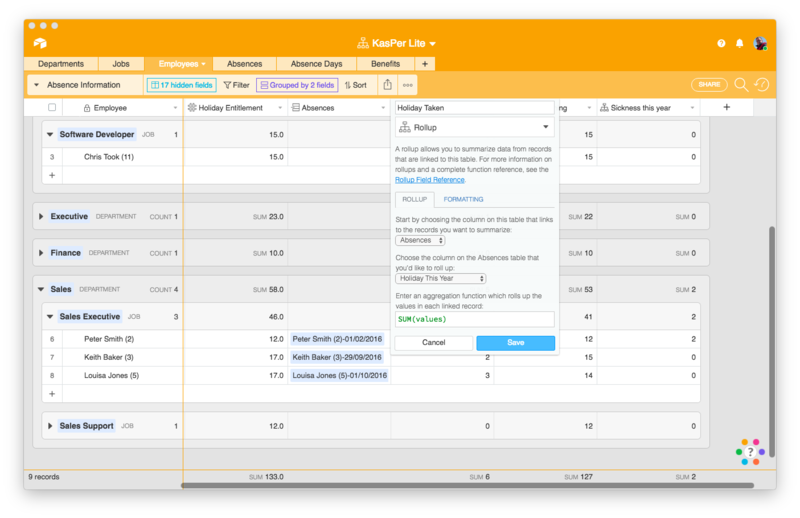 Airtable offers a revolutionary new approach to relational databases - designed to appeal to business users accustomed to working with spreadsheets. In this article I am going to look at the core Airtable app - and in a subsequent articles I am going to look into how the basic app's capabilities can be extended with Zapier and more advanced formulae. Airtable is a cloud database aimed at business users (rather than database specialists) - the company's stated mission is to "democratise software creation by enabling anyone to build the tools that meet their needs". In this review we will be measuring the product against that objective and getting an understanding of who the service is for and how well it meets their needs, both now and into the future as their experience grows. 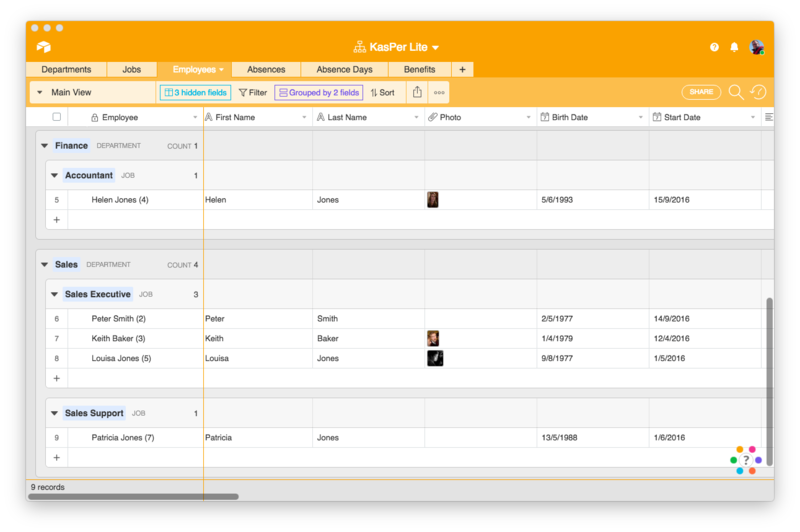 When you open Airtable you will see a screen like the one above, where your databases (bases in Airtable parlance) are displayed, and from where you can create new ones. New 'bases' can be created empty, created by loading data from a spreadsheet - or from a number of templates of which there are quite a few covering a range of needs. These are an excellent way to familiarise yourself with Airtable even if there isn't one which will meet your needs precisely. For this review, we are going to use a base I have ben working with called KasPer Lite. 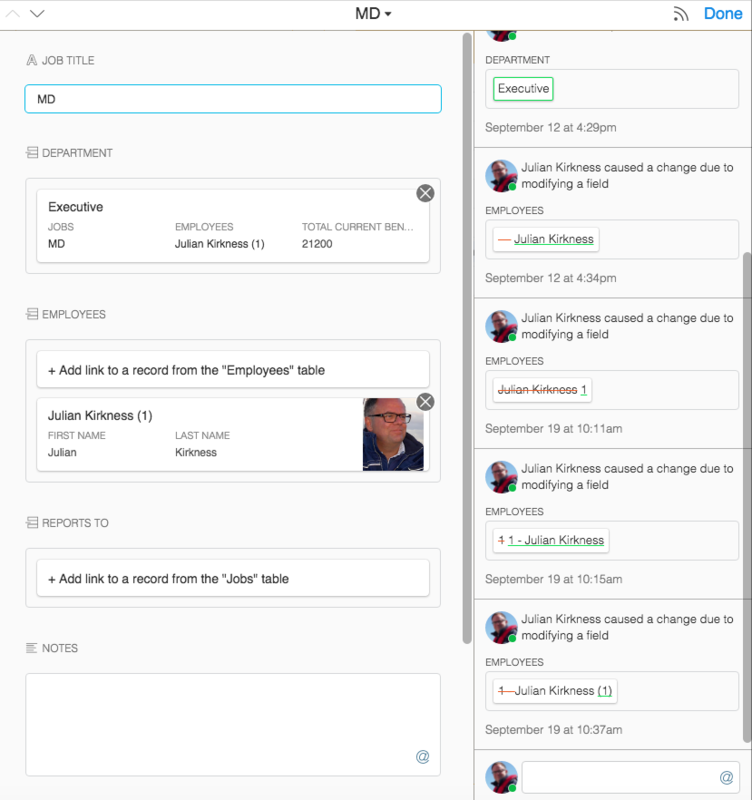 HR applications present a range of challenges which are common to a wide range of business scenarios and offer potential to explore how Airtable handles the relationships between information such as Employees, Jobs and Departments etc. There are a wide range of field types available including all the basics plus some which are concerned with the Relationships in your data such as Links to other Tables, Lookups from linked tables and Rollups which calculate values based upon linked records in other tables. There are also URL fields, checkboxes, single select and multi select fields, etc. Suffice it to say that there are fields types to meet most requirements and comprehensive summary and formula features to extrapolate from your raw data. You can create as many views as you like from each table and they are shared between all users. 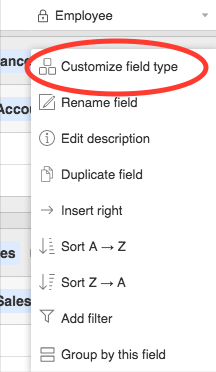 Within views you can determine which fields are displayed - and records can be 'Expanded' into a popup form for editing (you can also edit within the table for Grid views). The expanded view also shows a history of changes to the record and allows social interaction in respect of the record - using the typical @ mentioning to send comments about the data to other users. I particularly like this feature as it encourages team members to collaborate around your data. With this type of view you can choose which fields to display and also which field should be the Cover field (this is most likely an image as in this case). This form could be embedded on your company's intranet or simply available as a link. You are able to add help text to individual fields to make their use more friendly as well as choose which fields to include. My only criticism of Airtable's implementation of Linked tables is that you cannot specify what happens if records are deleted. For example (still from HR) if you were to delete an employee, I would expect the database to also delete information related to them such as their Leave records. In the case of Airtable, at the moment, this is not the case - there is no way to set up Cascade Deletes of this sort or, indeed, a method to prevent deletes, which can be important in other scenarios. The only way to deal with this situation is to manually delete the associated 'child' records - otherwise they remain in the database and could cause confusion. Having said all that, it is all very simple and user friendly to set up. I am showing the definition of the Holiday rollup here which simply sums the Holiday this Year field from the Absences Table. This is, in itself, a calculation which takes a total of Absence Days between the Start of the leave year and its end. 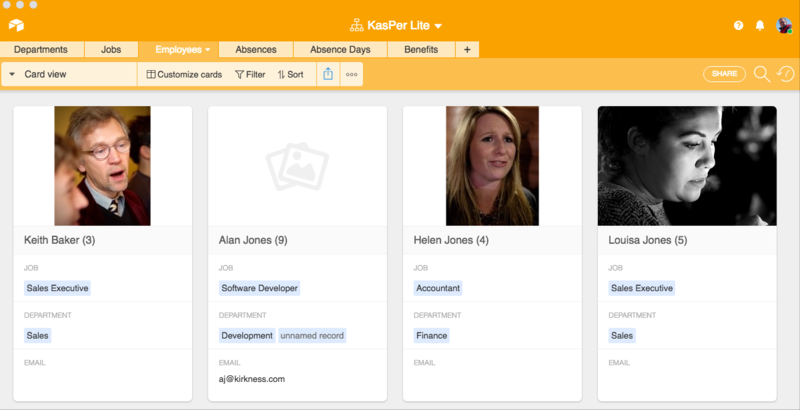 We'll look at Absences in more detail in the next Article where we will look at how to build more advanced calculations and also use Zapier to automate some processes. Overall there is a good range of tools in Airtable to analyse your data - but there are no Queries such as you would find in databases such as Access or MySQL. 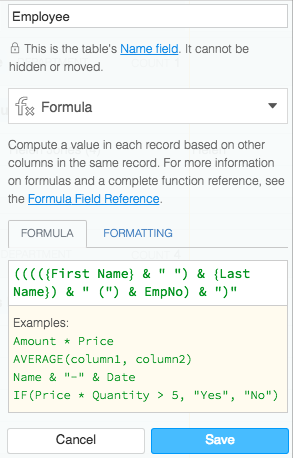 Your calculations are based upon Formulae, Lookup and Rollup fields. This approach is more flexible than it appears at first and would be very suitable for people new to databases - while more seasoned users will find ways to achieve most things. Users are able to set up as many Views as they want for each table and so there are many ways in which data can be analysed. It would be great to see some graph Views (bar charts, pie charts etc) available with the ability to summarise data as you can in Grouped grid views. Hopefully it is just a matter of time until this is available. There are some limitations - for example it would be nice to see the Grouping assigned to a Grid view reflected in the printed result. If you need to analyse your data further, then it can also be downloaded in CSV and you can also integrate your base with other services through Zapier which would enable you to send emails directly or sync data with services like MailChimp. Many people will love the look and feel of Airtable - it seems familiar (it looks like a spreadsheet after all) and you can easily build yourself a range of views to present your data in a number of ways. I am personally a little concerned about how easy it is to change data by accident - this is really a side effect of using a spreadsheet style interface - and would like to see features to restrict some users from accessing things or changing things. At the moment, security options are fairly limited with users able to edit records also able to change your carefully created views. Yes, Airtable is a multi platform solution (with the data in the cloud) and has clients for Web, Mac, Windows and mobile! All the screenshots in this article have been taken from the Mac app (which looks almost identical to using Airtable in a browser). There are apps for iOS and Android and these do have some differences (records are always shown in a list of tiles for example) and some features are not available (formula fields). However, having a suitably designed user interface able to access all your data from wherever you are is great. Airtable takes automatic snapshots of your entire 'base' periodically and also allows users to do so manually (a good idea before making any significant change) - you can also make a full copy of a base at any time. As mentioned above, you can also download data in CSV format. Airtable's data is, I believe, held on servers in the USA. This can be a problem for users in other jurisdictions such as Europe and we would recommend that users consider this in light of their local data protection regulations (in the case of the EU this is new EU General Data Protection Regulation (GDPR)). Airtable is a very accessible database application for newcomers to the database world or anyone needing to create a solution quickly. Despite first appearances, the system provides quite comprehensive ways in which to display and analyse your data. However, I am a little concerned by the lack of relational integrity in the database (no way to enforce Cascade Deletes for example). 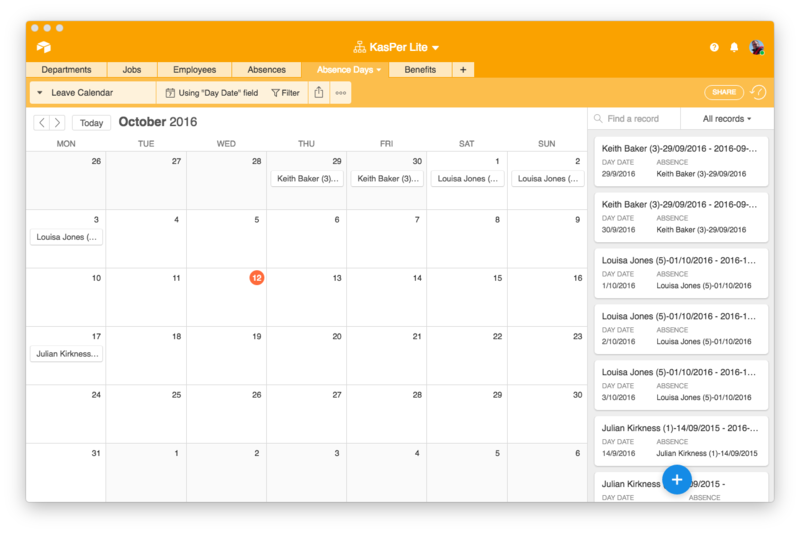 The user interface encourages you to work with your data, presenting it in different views, filtering it and sorting and grouping it in different ways. This is great in a small team - but could lead to confusion in a larger roll out where control over user's actions becomes more important. Finally, you can start with Airtable absolutely free! You will only need to pay for the service once you have a base containing more than 1,200 records - and then the cost is a still reasonable $12 per user for up to 5,000 records. Despite my few concerns, I thoroughly enjoy working with Airtable and would recommend you give it a try!